This entry is dedicated to Raquel, my friend who thinks making focaccia out of a box is OK.
Romans are credited with an array of modern marvels, from the arc to democracy; but how easily do we forget the gastronomic contributions they’ve brought forth to the culinary world. The taste of artisan bread perfumed with sprigs of rosemary and topped with a few crystals of sea salt is considered perfection in the eyes of gourmands around the globe. A predecessor to the pizza, focaccia’s extensive history has turned it into a versatile canvas for all sorts of delicious ingredients. Zesty sun dried tomatoes; briny olives; earthy crimini mushrooms, you name it and focaccia will deliver. For me, caramelized onions, charred red bell peppers and creamy goat cheese stand out as favorites. Also, in my recipe, you will notice that store bought pizza dough has replaced the 20 minutes of hard labor kneading and hours of proofing required to make focaccia dough, which is essentially a pizza dough; so without further ado, lets cook. Place the pizza dough in a bowl with a little bit of oil, cover and allow to proof in a warm dark place (inside a microwave does the job perfectly). In the mean time, coat a sauté pan with olive oil and cook the sliced onions for 30-45 minutes on low heat until they’re sweet and their flavors are concentrated. Deglaze the pan with balsamic vinegar, cook for another minute and set aside to cool. Salt the red bell peppers and place under the broiler until slightly charred. Then sauté them with olive oil and garlic for 7-10 minutes and set aside to cool. Coat a 10”x14.75” baking sheet (or one of comparable size) with olive oil and fit the proofed pizza dough. Sprinkle with the rosemary and make indentations along the entire dough to create nooks for the toppings and extra virgin olive oil to sink into. 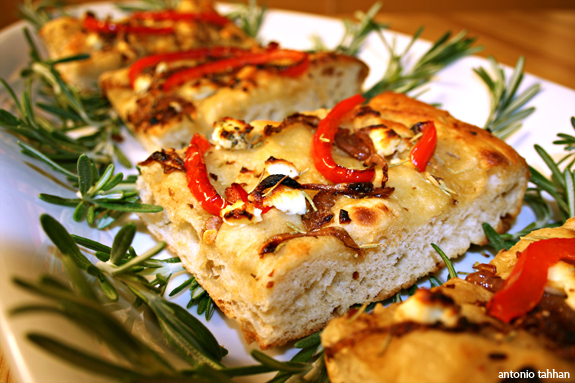 Top your focaccia with your cooled toppings and bake in a 400 degree oven for 15-17 minutes or until golden brown. Note: Add a pinch of salt to the onions while cooking to help break down the cell walls, get rid some of the moisture and concentrate its sweet flavors. Sprinkle a tiny bit of salt on the focaccia before baking for an authentic Italian taste. Now that you’re a pro at making your own bread, which always sounds impressive, explore its endless possibilities. Turn it into sandwiches, serve it as a side course, an afternoon snack, or dip it in olive oil and balsamic vinegar for an unforgettable taste – enjoy! Posted in appetizers, Italian, recipe, savory by Antonio Tahhan on October 7th, 2007. You can follow any responses to this entry through the RSS 2.0 feed. You can leave a response, or trackback from your own site.